The twentieth century has seen enormous leaps in our understanding of the universe. Ever larger telescopes provide views of distant galaxies and nebulas. New technologies reveal extraordinary objects that are invisible to the human eye. The Space Age has expanded our horizons: people walk on the moon and live in space stations and probes travel to the outer reaches of the Solar System. Space Watching incorporates the latest knowledge garnered from these daring explorations and equips you for space journeys of your own. 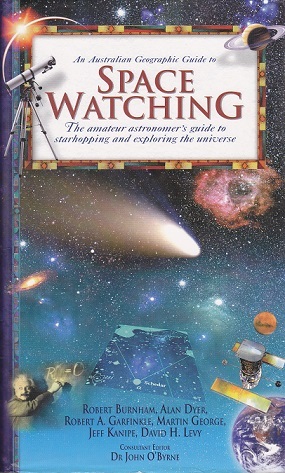 It provides practical advice on selecting the right tools for the kind of space watching you wish to pursue and includes useful hints on sketching and photographing celestial sights. The Sun and Moon dominate our skies and reward a closer look with a wealth of intricate features. You can learn how to safely chart the progress of sunspots across the face of the Sun or explore the craters and seas of the Moon using the eight detailed maps provided. The extraordinary variety of the planets, Earth’s neighbours, is revealed by the spectacular images taken by spacecraft. Once you know what to look for, a small telescope can show you such details as the icy polar caps of Mars, the changing cloud patterns of Jupiter and the splendid rings of Saturn. Beyond the Solar System, stars, nebulae and galaxies beckon. The wonders of deep space are explored in the Starhopping Guide. Designed for both Southern and Northern observers, this easy-to-use series of charts offers 20 telescopes tours through the sky’s most fascinating regions.